Nexon’s Darkness Rises game is now available worldwide, featuring console-quality graphics, thrilling combat, lots of game modes, boss battles, and much more. In the game, you choose one of the featured characters and embark on an intense journey-full of demons, dragons, reapers, bosses, monsters. And in this post, we have covered everything about the game you need to know: Darkness Rises guide and Darkness Rises tips, cheats & strategy to defeat bosses in boss battles and strike down the opponent in PvP battles. Everything in one post! Before we head to the cheats, tips & strategy guide part, let’s learn the basics first. In Darkness Rises game, your objective is to increase the power of your character and top the leaderboard by defeating enemies in PvP battles. At the beginning of the game, adventure mode is the single mode that is unlocked and it is the key to unlock all modes such as PvP, Infinity, Duo Dungeon, Raids, and more. Completing adventure mode stages unlocks new game modes and you will be able to take part in those modes for precious items such as gears, essence, and much more. And initial stages are very easy to complete, but as you progress, you will have to strike down powerful enemies; monsters, dragons, reapers, bosses, demons, and more. But if you steadily increase the power of your character, it will be easy for you to strike down bad guys. After a certain level, you will be able to access new features such as link skill, ultimate skill, runes, raids, fusing, crafting, jewels, and much more. Let’s start the Darkness Rises guide and after it, check out our Darkness Rises tips, cheats & strategy guide to master the game! In this part, we will learn about gears, skills, fusing, runes, crafting, polish, enhancing, upgrading, jewels, traits, costumes, PvP(PvP Specific Gears, Traits), adventure mode, Co-Op mode, and much more. Make sure to read everything. A rank and S rank gears are of high quality or rare. At the beginning of the game, you have D rank gears and they are of poor quality. 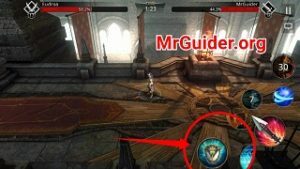 Read the cheats, tips part below to know how to obtain high-quality gears for free. Enhancing a gear increases its attributes such as defense, attack power, speed, and more. To enhance a gear, you need enhancing material. You can use polish or low-level gears for enhancing. For example; you have a level 20 sword and 5-10 level 5 swords. You can use these low-level swords as enhancing material to enhance level 20 sword. Read the blacksmith guide below to learn about polish. Upgrading the gear is one of the important steps in Darkness Rises game. By upgrading, you can increase the tier of that gear(for instance, you have C Rank gear. After upgrading, it will reach the high tier; B Rank). It will also increase the level cap. How to upgrade? Upgrade stone -> In Darkness Rises game, upgrade stone is an item, used in upgrading the gears; weapon, accessory, armor, and more. Without it, you can not upgrade gears. How to obtain upgrade stones? Unlock the Daily Dungeon Mode. On the main screen, tap the PvE option -> Daily Dungeon -> Begin Battle. Or complete the chapters in story mode. You can also purchase it from the shop. The player can obtain essence from the adventure mode. Once you reach the maximum level of these attributes, you will be able to raise max level. In Darkness Rises, you can equip up to three normal skills and one ultimate skill. 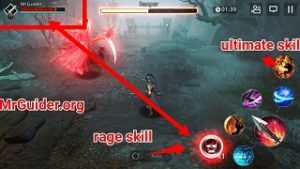 And in the battle, you can activate rage skill by filling the rage gauge. Let’s learn about all these skills. As you level up, you will be able to access or learn new normal skills. You can equip up to 3 skills for the battle; in all modes; Co-Op, adventure, PvP. To improve the performance of these skills, you can enhance the skills. It costs you skill points. You can obtain skill points as a reward, upon leveling up. After a certain level, link skill gets activated. After using the normal skill in the battle, you can instantly use link skill; back-to-back two skills – without cooldown break. Unlock new tiers to increase the maximum number of kills. Your first ultimate skill gets unlocked when you complete the main quest chapter 2. Ultimate skill deals massive damage to the monsters and increases the chances of getting the victory. You can upgrade the ultimate skill using scrolls. Scrolls can be obtained from honor shop. Go to the PvP section -> honor shop -> spend honor points and get scrolls. Obtain Honor Points by defeating the opponents. Refresh the list if the deal is not available. After clearing the 9-5 stage in the adventure mode, you will be able to access this feature. These runes also improve the character’s stats. You can obtain a high-quality rune by fusing multiple runes(read the blacksmith guide below). All the gears have default trait activated. Traits like Defense, HP, Recovery, and more. 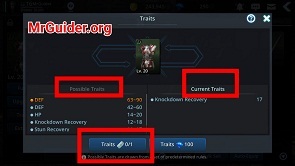 The player can change the trait using trait ticket. In Darkness Rises game, you can fuse & craft items to obtain a high-quality item. It’s called fusing. Visit Blacksmith to access fusing & crafting feature. You can fuse gears, jewels, and runes to get a high-quality item. For instance, you have D-Rank runes. Fuse them and you could get a high-grade item. Polish can be used to enhance the gears. In Darkness Rises game, the costume is one of the best items that can increase the power of character massively. How to obtain costume in Darkness Rises game? You can claim the costume chest free every 3 days. Or use diamonds. To defeat the opponents in PvP mode in Darkness Rises game, you should equip PvP Specific gears(if you have). Why? Tap the gear item to check either it’s PvP Specific or not. If yes, you will see [PvP] next to it. How to obtain PvP Specific Gears? So, this is the simple Darkness Rises guide for the beginners. Now, let’s start the Darkness Rises tips, cheats & strategy to master the game. In Darkness Rises game, you can significantly increase the power of your character by equipping with a costume. Go to the menu and head to the chest option. Then head to costume tab and open the costume chest. You can either use diamonds or wait until it gets free(after 3 days). You can collect gear chest, gold chest, costume chest after every certain amount of time. Gear chest includes weapons, armors like items. Gold chest includes random item, and costume chest include costumes. If you wait for some days, you will get high-quality gears for free. Play PvP mode, defeat the opponents and earn honor points. Spend honor points in the honor shop to obtain precious items such as scroll to upgrade the ultimate skill, chests to obtain high-quality gears, tickets to increase the reward, and more. Upgrade stones are required to upgrade the gears. Battle in daily dungeon mode to grab upgrade stones. Visit blacksmith and transform low-quality items to high-quality. Make sure to craft polish, level-up the blacksmith. Read the guide above.